What Do Walls in Guwahati Tell Us About Its People and Their History? Graffiti art strewn across the city asks the viewer to comprehend and participate in the ongoing conflict in Assam. Guwahati is gearing up for the general elections. After a choppy few months, things look settled. A last moment political truce between the regional kingmaker the Asom Gana Parishad (AGP) and the Bharatiya Janata Party (BJP) was a clincher. Unlike the neighbouring state of West Bengal, neither political commentators nor the people are expecting any surprises here. Wall inscriptions that dot the Guwahati cityscape during the election season speak of the rights of the khilonjiās or – the sons of the soil. These panels reflect the general mood after the Citizenship Amendment Bill (CAB) of 2016 was passed in the Lok Sabha on 8 January, 2019. In a political scenario that’s overshadowed by the NRC (National Register for Citizenship) and the CAB, it is believed that the electoral mandate will reflect a trust in the politics that upholds the rights of the sons of the soil against that of the bongāls. The word bongāl, however, isn’t a recent coinage. In contemporary Assamese (Axamiyā/Asomiyā) the word refers to a foreigner and is thus often thought to have emerged during the anti-foreigner’s movement or the bongāl khedā (foreigner eviction) beginning in the 1950s and continuing throughout the 1960s. It is certainly true that the meaning ofbongāl underwent major changes during the turbulent days of the foreigner eviction movement and was used for those Bengalis who had not assimilated with ‘Axamiyā’ culture. They could be both Hindus and Muslims but in most cases, they were Bengali speakers. In the later years (post eviction movement days) bongāl gathered a more targeted meaning – Bengalis from present day Bangladesh who have ‘illegally’ settled in Assam. Today, for a khilonjiā, a bongāl is not just a foreigner but someone who has illegally settled in the soil of Brahmaputra Valley and has no papers to prove his citizenship status. One of the earliest references to the word bongāl can be traced back to 18th century war chronicles written by ganaks or astrologers (accompanying the Ahom army) in literary Assamese. There the word refers to the soldiers of the Mughal military commander Mir Jumla (now buried in the west Garo Hills) and later the Rajput general leading the Mughal forces, Raja Rama Singha. It is recorded that the Ahom soldiers pledged to cut off the bodies of the bongāl soldiers with the hengdāng or the sharp narrow blade which would later become a symbol of militant nationalism in Brahmaputra Valley. The war chronicles never use the word moghol (for the Mughal soldiers) nor musalman (for Muslims). Bongāl appears to take care of both. In fact, in the chronicles bongāl was used for anyone irrespective of religious affiliations who came from the lands lying west to the territories of the Ahom rulers. Later, in colonial Assam the adjective bogā(white) was used before the noun (bongāl) to refer to the English as bogā bongāl. And, the Assamese lexicon Hemkosha compiled by Hemchandra Baruah in twentieth century lists the compound word bongāl ghā to mean Syphillis. It is only in early twentieth century that the word bongāl was translated as foreigner by lexicographers and historians like Hemchandra Baruah and Surya Kumar Bhuyan. And, in course of next few years, the word appeared in translation as a foreigner in multiple locations, mostly narrative histories on the deeds of the famous Ahom ministers and generals like Atan Buragohain and Lachit Barphukan. These narratives not only partook in the reconstructive task of the nationalist scholar but also interpreted the history of the region as a constant struggle between the insiders and the outsiders. They used the method of reconstructing history through anecdotes and legends in order to draw the people and their heroes within a shared historical space folded with the everyday. The practice of narrating the past, thus, contributed towards the construction of a typological history whose core lay in the military conflict of the insiders and the outsiders. In postcolonial Brahmaputra Valley, this history underwent further changes and the military conflict, thus, began to acquire a meaning outside the event (early modern Ahom-Mughal conflicts) and its temporal location. It was no more an event frozen in time. It started to appear as a conflict that can only be expressed in the present continuous tense as an ongoing action. This opened the possibilities of political expression as history was being interpreted as a moral fable – a tale of rewards for unflinching bravery. Within the new political context of postcolonial Assam, the insider was a son of the soil (khilonjiā) whose right to resources were always under the threat of the outsiders (bongāls) who came in hordes like ‘ants’ and ‘crows’ and ‘scavenged’ on them. These words that gained currency in postcolonial Assam echoes the sentiments of the bogā bongāl (white outsider) C.S. Mullan who used the exact words to refer to Muslim settlers in the valley (who came from eastern Bengal) in the census reports of 1931. The son of the soil was now located within a new political aesthetic space. His duties included being aware of the possession of hengdāng and the possibilities that came with it. Like the eighteenth-century Ahom soldiers, he used the hengdāng to remind himself of his location. However, his hengdāng was not meant to be used in heroic battles but was an object of threat in the everyday conflict with the outsiders, or, for instance, disgust and distrust as expressed in the following popular Bihu lyric. 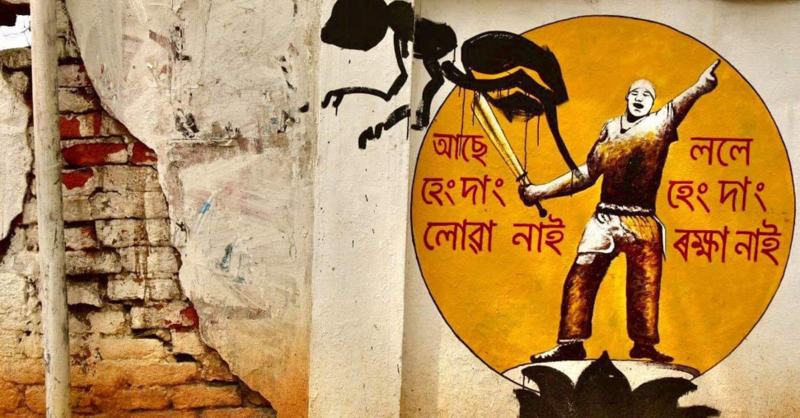 Within this space of a majoritarian political expression, the iconography of the outsiders or bongāls as poisonous ants and crows explain their location in the realm of elimination. Their dark bodies (kolāsarīra) are a sight of disgust. Their living is understood as an act of scavenging and their dwellings are believed to have been built on the resources of the insiders. The very precarity of their existence carries the burden of a possibility of elimination. Although unlike miya, bongālisn’t a political identity claimed by a people, yet,its location as a concept-metaphor allows us to understand the political imagination of a majority people. In one of his recent political speeches, the BJP president Amit Shah expressed this majoritarian viewpoint while referring to the bongāls as termites who ‘are eating the food that should go to our poor and taking their jobs’. 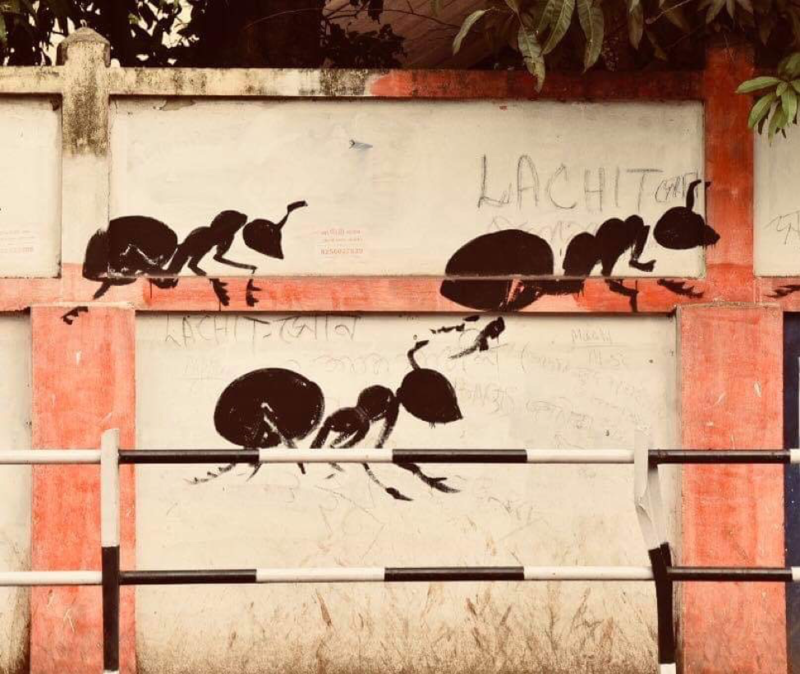 The ants and crows that have suddenly come to occupy the walls of Guwahati in the election season are embedded within this larger narrative of an ongoing conflict. 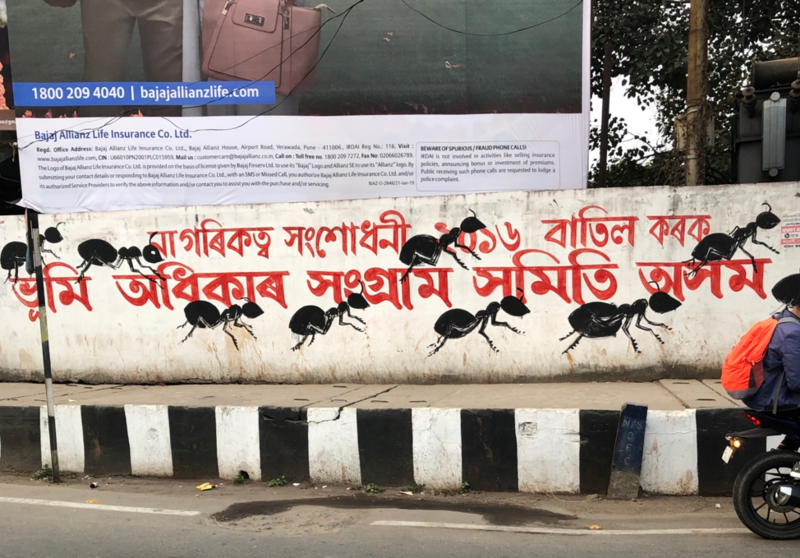 The locations of the wall inscriptions that depict the ants and crows dotting the primary nerve centers of the city speak about a strategy of letting know. These panels ask the viewer to comprehend and participate in the ongoing conflict and their banal existence is indicative of the way in which they have been normalised in the everyday sphere of the public. These wall inscriptions are an articulation of the thundercall of the insiders (khilonjiār bajroninād) that tears through the present with the promise of a political future lying on the other end of an elimination. Are we witnessing a blueprint of a history of the majority people here? Only time can tell. Samyak Ghosh lives in New York and studies literature and history at Columbia University. Suraj Gogoi is a doctoral candidate in Sociology at the National University of Singapore and tweets @char_chapori. All photographs used in the article are taken by the authors.